themselves for a safe and free world!! Get Your Free Gift !!! Click on the Above image for a larger copy. Japan began its first military intervention with China in 1931 when they occupied Manchuria. Their concerted efforts began in 1937 and they conquered many areas of China. Efforts to expand her influence in the Pacific brought strong protests from Washington and other countries. It was 7 A.M. on December 7, 1941 when Japan began and successfully completed a sneak attack on Pearl Harbor, Hawaii. The U.S. was completely surprised and unprepared for the attack, which lasted for 110 terror-filled minutes. The Japanese became masters of the Pacific. On August 15, 1945 the Japanese people heard the voice of their Emperor, Hirohito, announce on the radio that Japan would accept the allied surrender conditions. 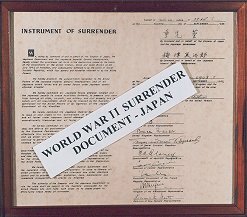 The official surrender by Japan took place on board the U.S. Battleship Missouri in Tokyo Bay at 0904 hrs on September 2, 1945. 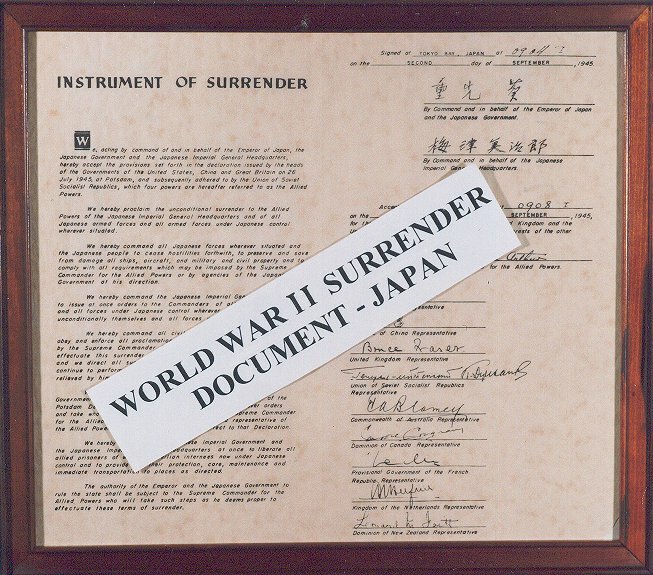 Order your documents of surrender and you will have a document that only a very few have ever seen. Only a very few were prepared and signed. Get a part of world history! Give 'em something to talk about.